As 2018 PG Tre Jones's recruitment continues, the school his older brother Tyus helped lead to a title in '15 increasingly seems like his likely destination next year. NORTH AUGUSTA, S.C. — When Tre Jones says Duke is not the leader in his recruitment, you can come up with reasons to take him at his word. Consider one of the other programs pursuing him, Minnesota. Jones attends Apple Valley High School, which sits about a half hour south of The Barn, the Gophers’ 14,625-seat arena in Minneapolis. Under fifth-year head coach Richard Pitino, Minnesota projects as one of Michigan State’s top challengers for the Big Ten championship this season after increasing their win total by 16 games, to 24 from eight, in 2016–17. And the Gophers have received verbal commitments this year from three of Jones’s teammates on his Minneapolis-based Nike Elite Youth Basketball League team, Howard Pulley, all of whom hail from the North Star State: four-star center Daniel Oturu, three-star power forward Jarvis Thomas and three-star shooting guard Gabe Kalscheur. Those factors amount to a compelling case for Minnesota as a serious contender to nab Jones, but they haven’t done much to shake the prevailing perception that he’s headed to a different school on the East Coast: Duke. 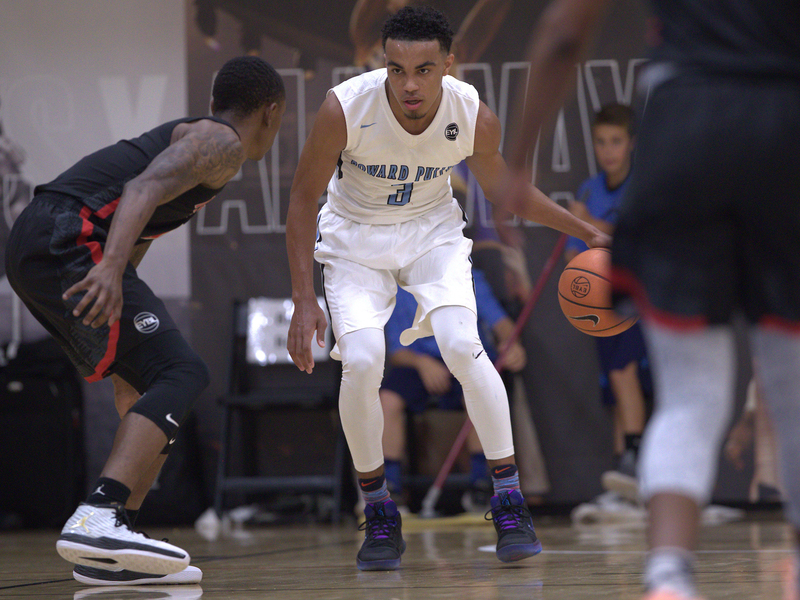 Jones is the younger brother of Tyus Jones, who went one-and-done in Durham after finishing his career at Apple Valley as a five-star recruit in the class of 2014. Like Tyus, Tre plays point guard, and he’s ranked No. 1 at the position in the class of 2018, according to the 247Sports Composite. He and Brentwood (Tenn.) Academy’s Darius Garland are the only two PGs in the class known to have received a scholarship offer from Duke. “I would be very surprised if [Jones] doesn’t choose Duke in the end,” says Andrew Slater, a national college basketball recruiting analyst for 247Sports. Sports Illustrated watched Jones take on one of the best prospects in high school basketball, power forward Marvin Bagley, at the EYBL Peach Jam in North Augusta, S.C., last month. It was a high-profile, head-to-head matchup in the sense that two esteemed players were squaring off in the summer’s marquee grassroots event, but the final outcome probably doesn’t say much about the impact each player could have at the next level, in part because Jones had a much better supporting cast around him. With Blue Devils assistant Jon Scheyer looking on, Jones scored 18 points, recorded eight assists and pulled down eight rebounds to lead Howard Pulley to a 77–63 win over Nike Phamily and Bagley, who is reportedly considering reclassifying to 2017 from ’18 and playing for Duke. The biggest takeaway from the short session was that Tre is at least trying to make people believe he hasn’t made up his mind yet. If he’s being candid, then an as-yet-undetermined program could be on the verge of beating out one of the nation’s two premier recruiters (the other is Kentucky) for a top-notch point guard with a family connection. If Tre’s playing coy, Duke is about to bring in a slightly different version of the freshman floor general that anchored the backcourt of its last national championship team, in 2015. When you watch Tre, it’s difficult to block out Tyus. There is a temptation to view everything Tre does on the court through a comparative prism, to think about how his older brother would have handled similar plays in similar situations. There’s a strong possibility Duke would need Jones and Garland to take on heavy minutes right away. Senior Grayson Allen is entering his final year of eligibility (yup, he’s still here), and the point guard recruit the Blue Devils signed in the class of 2017, IMG Academy (Fla.) five-star Trevon Duval, could jump to the NBA after one college season. That would leave Duke with a thin backcourt rotation. The Blue Devils are bringing in three shooting guards in their 2017 class, Prolific (Calif.) Prep’s Gary Trent Jr. and Georgia products Alex O’Connell and Jordan Goldwire, but only one of them (Trent Jr.) is rated in the top 50 nationally by any major recruiting service. Irrespective of how many of that trio are ready to handle a big workload as a sophomore, the Blue Devils wouldn’t have much behind them. Grabbing at least one other guard plus Jones in 2018 would alleviate the depth shortage. Maybe it’s too soon to start thinking about what Duke’s backcourt would look like with Jones around. He hasn’t said he’s actually going there. It just feels like a matter of time before he does.